A beautiful arrangement of flowers blushing with its floral beauty Make this special day even more special with the elegant and effortless beauty of pretty red rose flowers. Spoil your special someone with this exquisite flower arrangement of roses. 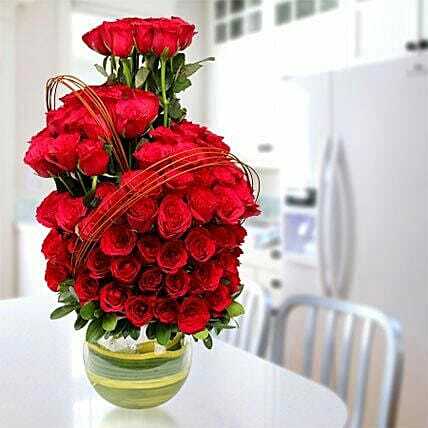 Express your feelings with this gorgeous and luscious arrangement of romantic flowers.Where your pleasure is, there is your treasure: where your treasure, there your heart where your heart, there your happiness.Saint Augustine Meaning of flowers: Red roses are the symbol of love and romance.